Vertical Charger Stands (CS-VMP) from BHS provide a safe, convenient location for vertical-mount battery chargers. They’re available in three models, and the largest can support three battery chargers on a single unit. 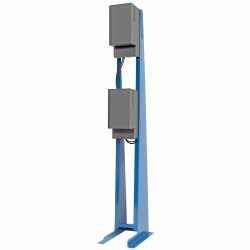 Vertical Charger Stands are designed for battery room environments, with all-steel construction and a powder-coat finish that resists acid and abrasion. At the same time, their tall, tapered construction allows them to remain stable with a minimal footprint. By placing up to three vertical-mount battery chargers on a single unit, you save valuable floor space. Install Vertical Charger Stands anywhere in the facility for quick access to battery chargers. Their versatility of placement makes these units ideal for park and charge applications. Wherever you place them, these heavy-duty stands help to protect charging apparatus from accidental impact with forklifts and other material handling equipment. An optional integrated arm can be added to the CS-VMP-2 and the CS-VMP-3. This extension improves cable management by allowing users to route charger cables directly over charging batteries. To learn more about Battery and Charger Stands from BHS, or to find your local dealer, contact the sales team at +1 314 423 2075.